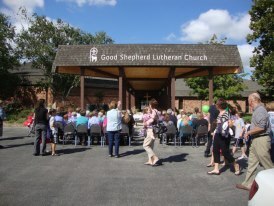 Yesterday we returned from a trip to help celebrate the 50th anniversary of a church my father-in-law started. It was his first assignment as a mission pastor and he would have been so proud to see the vibrancy of the community he began. It was the early sixties and the community was growing. When the church was built, it was surrounded by cornfields. Today it dwells amidst established homes and mature trees. Two additions have been made to the building, the first within a year of the original construction. At the 50th Anniversary Dinner, the highlight of the evening was the stories. Many of the original charter members were in attendance and they shared their stories of the people who worked together to build the church community. One man talked about how the pastor had a reputation for following the moving vans, inviting new families to church before the last boxes were even off the truck. Another remembered being drafted to start the Sunday school program and staying on to run it for 17 years. One woman talked of having to prepare sermon outlines because her confirmation class had fallen short of the pastor’s expectations. My husband shared a time when the family dog escaped from the parsonage and ran up the center aisle of the church during Sunday service. They talked about church council, the work they did building and maintaining the church, vacation bible school, bible study, choir, church softball leagues, the women’s group, youth groups and the characters who gave the stories life. Memories shared elicited more memories and the sanctuary was filled with joy. People smiled that evening as they recalled the journey that brought them to today. There was sadness at the loss of treasured friends (including the pastor) and warm hugs for friends who were visiting from afar. Mostly there was joy in commemoration of the shared history that serves as a foundation for their shared future as a church community. That history was celebrated in the stories they told. This entry was posted in Family, Home, Religion, Stories, Traditions. Bookmark the permalink.